Surge Petre, Missa Surge Petre, Ave Maria a 3, O vos omnes, In illo tempore … Non turbetur, O pulcherrima inter mulieres, Domine, non secundum peccata nostra. You would be forgiven for not having heard of the Renaissance composer, Jacquet of Mantua (1483-1559), and can blame the oddities of personal names at the time. He was known by a variety of names in his day, including Jachet de Mantoue, Iachet da Mantova, Iachetus Gallicus, Jacques Colebault or Collebaudi, but usually simply as Iachet (= Jack). He has also been confused with other composers, particularly Jacquet de Berchem. Born in Brittany in 1483, Jacquet of Mantua moved to Italy sometime before 1520, finally settling at the Gonzaga court in Mantua around 1527, following a year in Ferrara with the related Este family. In Mantua his patron was the Bishop, Cardinal Ercole Gonzaga, who funded Jacquet’s position as maestro di cappella of the city’s cathedral. When the Cardinal became president of the Council of Trent, he actively promoted Jacquet’s music. As well as the problems of his name, there are very few available editions of his music. Much remains unedited, including half of his 23 masses. The parody mass Surge Petre has been edited for this recording. Along with its linked motet, it is written in six parts, suggesting composition for a patronal festival in Mantua Cathedral, dedicated to St Peter. The motet and mass are written on a grand scale, but both include some wonderful moments of repose, notably at the start of the second part of the motet, and in the concluding Agnys Dei, the latter a gorgeously reflective unfolding of sound. Some of the following motets are in a similar meditative mood, including the little Ave Maria, performed here by the sopranos and alto voices alone. 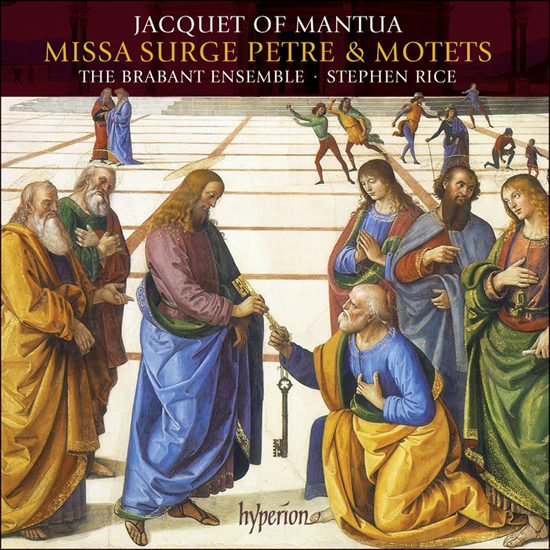 This CD demonstrates just how extraordinary Jacquet’s music is, with its combination of power and delicacy in equal measure. Lovers of (the slightly later, and English) Tallis will recognise some of the harmonic twists and turns and distinctive false relations.